The QNAP TS-269 Pro is a 2-bay, all-in-one NAS server with exceptional performance that can meet the storage requirements of modern SMB IT environments. Features include, secure cross-platform file sharing for Windows®, Mac®, and Linux/UNIX users, an iSCSI/ IP-SAN storage combo solution and a number of versatile, value-added business applications. 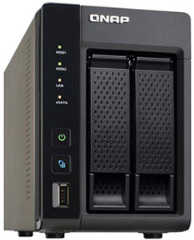 With a well-rounded set of backup solutions integrated in the QNAP TS-269 Pro, critical business information can be safely protected against unexpected data loss. The QNAP TS-269 Pro is also an ideal shared storage solution for virtualized and clustered environments, via VMware® Ready™ and Citrix® Ready™ certification, and a proven compatibility with Microsoft® Hyper-V environments.